Apple iPad has yet again encountered another problem, this time with the Wi-Fi connectivity. The users and news have all been fed up with the “heating iPad” topic, but for a relief this time it isn’t the heating but the problem over the Wi-Fi on the new iPad. 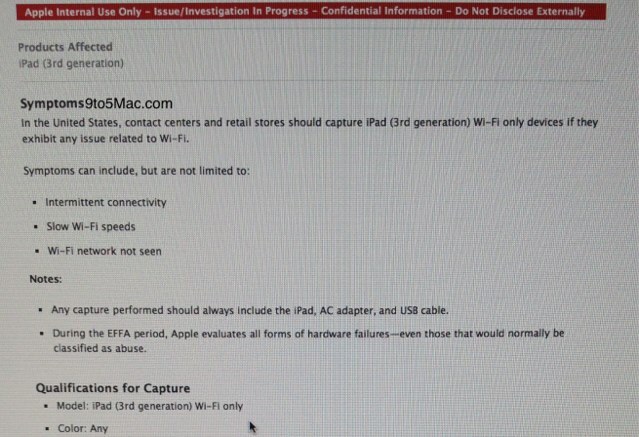 There have been plenty of issues with the iPad since its launching this year, now the internal AppleCare document has surfaced that reveals that Apple is currently investigating the Wi-Fi issues that are affecting the new iPad. iPad users are now going through a variety of issues including connection drops, slow download and upload speeds and even issues picking up a Wi-Fi signal some time. Users said to be working on an iPad and notebook alongside were receiving perfect reception in the notebook yet a very weak signal for the Apple product. Reports from 9to5Mac read that a thread on the Apple support forum has more than 700 replies from users with the same issues. 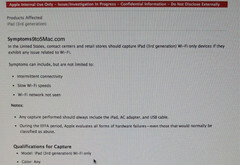 The aforementioned document also states that retail stores should replace or capture any Wi-Fi only device that would exhibit the Wi-Fi related issues like intermittent connectivity, slow Wi-Fi speeds and undetected Wi-Fi networks. The tablets are now being returned for testing along with all included accessories.